Coleman Johnson is an elite scout and is much too good for our program but we got a bargain on him. Gullett and Hill are both mediocre and the type of people I expected to sign. Next on the agenda is setting up our schedule as well as perusing the roster. The first year will probably be our worst season as the roster will be very poor and hopefully we can see continued and sustained success. Next I want to give a preview of our 20 player call list. We don't have any preference as far as position goes as we are just trying to get any type of talent in here. Right now there are three players with high interest that are 3 stars and a few 2 stars with high and very high interest. There also are some 1 star guys on our call list that we will be scouting who put up big numbers in highschool. We will see if those big numbers and low star rating was due to poor competition or due to bad initial scouting. Hopefully we can find a few hidden gems. 12 of the people on our call list are from Texas and 3 are from Oklahoma so 75% of our call list is very local. Only one is international which is a player from Canada which is nice because scouting international players is costly. Nickolas Toy is our player with the most potential and could be a solid player by the end of his career. We don't have any specific go to players here but my guess is that Toy would put up the best numbers on the team this year. The bench is pretty poor but Tom Johnson is at least a nice 3 point shooter. I don't have high hopes for this season but hoping for the best! Great to see two dynasties being posted simultaneously on the forum; I'm following both. Like you I still go back to this fabulous game after large time gaps. A shame Brian didn't get to develop some of his ideas to elevate this game even further. Still delighted though with what it offers. I agree with your initial recruiting strategy to get some talent on the roster regardless of position. Obviously if you don't manage to recruit any big men this year, you will have a challenge next season with three of your four inside men graduating. Of course you will need to address that at some point, but the time to judge is in four years time when your roster consists of all your own recruits. Last edited by CentreCourt : 02-03-2019 at 10:24 AM. Final Score: Grand Canyon - 54, Abilene Christian - 43. We were down by 20 in the first half and made it a single digit game late in the 2nd half but couldn't make a full comeback. The fouls hurt us as in the second half we committed 8 and they committed 0. Michael Martinez and Michael Rodriguez both had 8 points and Rodriguez also had 8 rebounds. We didn't play great in this one but after scoring only 2 points in the opening 8 minutes things got a lot better as the game went on. Michael Martinez broke his finger and will be out for 7 days. Final Score: Grand Canyon - 46, Maryland Eastern Shore - 62. We were thoroughly beaten again as we couldn't stop any sustained run by the opponent. So far this season we have made a total of one 3 pointer on 17 attempts and it was by our center (whose 3 point rating is a 4 out of 100). Hopefully we stop taking the 3 as any of those shots have turned into wasted possessions. There were certainly positives from this game but foul trouble did us in again. Michael Martinez had 10 points and 7 rebounds while Michael Rodriguez had 8 points and 10 rebounds. Jonathan Philip tacked on 10 points of his own. Nickolas Toy has been a disappointment through 2 games so far and we need to see more from him. Final Score: Abilene Christian - 43, SIU-Edwardsville - 41. We get our first win in program history! Jonathan Philip was the player of the game with 16 points and 3 rebounds. Nobody else had more than 6 as he carried the team on the offensive side of the ball. Michael Rodriguez helped out with 14 boards including 6 on the offensive glass. Our lead stretched to 14 at one point but we were unable to keep it large but never trailed in the entire game. Final Score: Abilene Christian - 55, North Carolina Central - 45. This team may not be the most skilled but they play with a lot of heart. In this one we committed 14 turnovers while NC Central committed only 6. We out-rebounded them 45-21 though, including an astounding 17 offensive rebounds - and those offensive rebounds were the reason we came back and won this game. Michael Rodriguez recorded the first double-double in program history with 10 points and 12 rebounds. Michael Martinez had 7 points and 11 rebounds while James Reuter and Jonathan Philip both had 10 points. This was a true team effort as it also included 12 points off the bench. We were down throughout most of this game but I was proud of the team because of how hard they played, I didn't expect it to turn into a win but am ecstatic that it did. Final Score: Omaha - 42, Abilene Christian - 49. James Reuter led the way with 16 points and 6 rebounds and Michael Rodriguez added on 8 points to go along with 8 boards. We didn't play our best game in this one, evidenced by the 17 turnovers but thankfully Omaha committed 17 as well. This one gets us to a winning record and although all our opponents have been awful it at least feels good to get some wins strung together. Final Score: Abilene Christian - 56, Northern Kentucky - 52. Michael Martinez led the way with 14 points while Jonathan Philip had 12. Michael Rodriguez pulled down 8 rebounds and we were able to secure the win and overcome 14 turnovers. This 4 game win streak has been great for team morale. Our Top two targets spurned us for other schools. Arthur Evans decided to attend Texas Tech and Joseph Walsh decided to attend UTEP. Right now our biggest focus is on PG Douglas Arguello who is a good shooter and even better defender. Getting him would be a huge boost. Final Score: Abilene Christian - 56, NJIT - 61. Our ability to score is not in question but it is the turnovers as we had 19 in this game. This is while playing at a slow pace as well so it isn't as if we are trying to force the ball and turning things over. Recruiting ballhandlers will be a big part of our future. Nickolas Toy had 19 points to set a school record and James Reuter had 8 points and 7 assists. Our little win streak has come to an end and even though we lost it was a close game that came down to a 1 point game in the final minute. Final Score: UMass Lowell - 55, Abilene Christian - 64. I am so proud of the team after this one! We were down 31-17 at the half and fought back for a huge comeback! Then with 9 minutes in the second half and down 49-35 we went on a 19-0 run to take a 54-49 lead and hold on for the victory. I was absolutely amazed as it looked like we were toast in this one but the boys really fought back. We got into foul trouble early as four of our starters ended the game with four fouls, so the bench saw a lot of minutes and produced with 27 points including a career high 10 for Ali Morales. Jonathan Philip added on 13 points and James Reuter had 10. Michael Rodriguez finished with 8 points to go with 13 rebounds. This one could be a huge momentum builder moving forward and a 19-0 run is one of the biggest runs I have ever witnessed. Final Score - Abilene Christian - 51, Bryant - 61. The refs were blowing the whistle early and often as this one saw 26 fouls in the first half. The fouls were aplenty but this one came down to turnovers and how we made 17 compared to Bryant's 10. Nickolas Toy and Jonathan Philip both had 11 points and Michael Martinez had 9. This one was disappointing and further reinforces our need to cut down on turnovers next season. Final Score: North Dakota - 51, Abilene Christian - 46. Turnovers were big again as we committed 17 to their 12. Free throws were big as well as we shot 7 to their 34. Jonathan Philip had 11 points and Michael Rodriguez had 8. The bench had a solid game with 19 points and had a very solid game. Final Score: Abilene Christian - 43, Nicholls - 54. We had 17 turnovers again in this game (compared to only 12 made field goals). Nickolas Toy had 11 points and Jonathan Philip had 9. Michael Rodriguez had 12 rebounds including 7 on the offensive side. This was a rough start to conference play but with our turnover total it could have been a lot uglier. Final Score: Abilene Christian - 38, Howard - 64. We made 13 field goals and committed 16 turnovers as those again came up big and cost us dearly. Jonathan Phillip had 8 points and Michael Rodriguez had 7 rebounds. This one was a very rough game and we hope we can bounce back soon! Final Score: Abilene Christian - 44, Stephen F. Austin - 49. Stephen F. Austin had 5 steals but we committed 19 turnovers. I am actually very excited for the future as we are having a lot of close games and once these turnovers decrease we will be looking very good, and with a lot more talent. Jonathan Philip had 12 points and Nickolas Toy had 10 points. Philip also had 8 rebounds and went 8-8 from the free throw line and we went 16-18 from the free throw line. Our 19 turnovers dwarfed our 14 made shots in this one. Final Score: New Orleans - 42, Abilene Christian - 50. We only had 9 turnovers in this game which was a huge contributor to our win! Jonathan Philip had 16 points with 7 rebounds and 2 assists en route to player of the game honors. Michael Rodriguez had 11 points and 6 rebounds. The bench had 10 points in this game and really helped us out. We have our first recruit! PG Douglas Arguello from Sunray, TX has decided to play for Abilene Christian next year. He is a plus defender with the potential to be a very good jump shooter. His defense is already well developed which will help him see playing time. We had another scholarship offer out to PG Van Eliason but he declined our scholarship offer and committed to North Texas. Final Score: Northwestern State - 49, Abilene Christian - 60. We did commit 13 turnovers in this one but Northwestern State committed 15. Michael Rodriguez was the player of the game with 14 points and 11 rebounds for a double-double. Jonathan Phillip had 13 points and Nickolas Toy had 11 points. Final Score: Abilene Christian - 44, Sam Houston State - 60. We were outclassed by a much better team in this one as we committed 16 turnovers to their 8. Nickolas Toy led the way with 8 points and Michael Rodriguez had 11 rebounds but outside of those numbers nobody else had much of a great performance. Final Score: Central Arkansas - 43, Abilene Christian - 53. We had 18 turnovers in this one but were able to overcome them as Tom Johnson came up huge off the game with 10 points and being perfect from the field en route to player of the game honors. Jonathan Philip also had 11 games and 8 rebounds and Michael Rodriguez had 7 rebounds. Final Score: Southeastern Louisiana - 45, Abilene Christian - 42. This one was the most frustrating loss of the year. We lost the turnover battle per usual (13 to 9) but we shot 5-13 from the line including 1-6 in the final 2 minutes. They threw the game away with 4 straight turnovers to end the game but we capitalized off those 4 turnovers for a total of 1 points. Michael Martinez had 9 points but nobody else did much worth mentioning. Even with our limited talent this is one that we quite frankly should have won. Final Score: Abilene Christian - 36, McNeese - 53. This was a rough one as we only scored 36 points and committed an ungodly 24 turnovers! The bench actually outscored the starters 22 to 14 and Tom Johnson had a team high 9 points. Michael Martinez led the team with 7 rebounds and we again see that the turnovers were too much to overcome as we had twice as many turnovers as made shots (12). Final Score: Abilene Christian - 70, Houston Baptist - 47. This was our best game of the season so far as we played great as a team. We limited turnovers by only committing 12 (Houston Baptist committed only 9). Jonathan Philip had a game-high 21 points while Michael Rodriguez filled the stat sheet with 7 points, 10 rebounds, and 5 assists. James Reuter and Nickolas Toy both added on 11 points of their own. Not much recruiting news right now. We have offers out on two Power Forwards, Michael Mitchell and Virgil Yager. Mitchell is 6'6" and is a JC player. He is not much of an offensive threat but is a defensive specialist who should lock down his defender. He also is a menace on the offensive glass. Virgil Yager is 6'10" and from Oklahoma. He is a triple threat as he is effective from the inside, from behind the arc, and is a terrific passer. He is competent on the defensive side of the ball where his best quality is his ability to block shots at a high rate. Final Score: Abilene Christian - 61, New Orleans - 52. We only committed 7 turnovers in this one and got a huge road win to move us to .500 in conference play this season. So far we have had some rough games but we have exceeded my expectations in conference play! Michael Martinez was the player of the game with 15 points and 7 rebounds. James Reuter had 13 points and we finished strong to end up with the victory. Unfortunately Michael Rodriguez was injured in the New Orleans game and suffered a broken foot. He will be out for 56 days which looks like it will be for the remainder of the season. Henry Kozak will replace him in the lineup and that loss is a big blow to the rest of our season. Final Score: Nicholls - 53, Abilene Christian - 56 in OVERTIME! Tom Johnson hit a 3 with 16 seconds left to tie this one and send us to overtime at 45 apiece. This one was our first overtime game of the year and was a thriller! We could have secured the win easily in overtime but our free throw shooting really let us down as we went 17-28 in the game from the line. Nickolas Toy had 15 points with 5 rebounds and Michael Martinez had 10 points and 6 rebounds. We only turned the ball over 10 times which is pretty impressive since this game included an overtime. This win gets us back to a .500 overall record on the season and gives us a winning record in conference play! Also the 3 game win streak is a nice look. Final Score: Sam Houston State - 65, Abilene Christian - 51. We got out to an early 12 point lead which was surprising but we were unable to keep the lead. Until the final 2 minutes we were never down by more than 7 points and this one was a lot closer than the final scoreline shows. Michael Martinez had 12 points and 8 rebounds while James Reuter had 9 points and 5 boards. The bench had 15 points in this one and were huge in keeping us in the game. Final Score: Stephen F. Austin - 77, Abilene Christian - 37. We had 18 turnovers in this one but we were thoroughly outclassed in every aspect of the game. Stephen F. Austin only made 6 more shots than us but attempted 45 free throws. Jonathan Philip had 10 points and Michael Martinez had 8. Hopefully we can right the ship in the second half of the month after these two losses to good teams. Final Score: Abilene Christian - 54, Southeastern Louisiana - 50. Jonathan Philip led the team with 15 points while James Reuter had 11 and Nickolas Toy had 10. Henry Kozak led the team with 9 rebounds. This was the bounceback win we needed! Final Score: Abilene Christian - 39, Central Arkansas - 73. We started out slow in this one as we it took 11 minutes for us to score our first points and make our deficit 16-2 and it never got any better from there. We had 15 turnovers and 17 rebounds to their 34. Jonathan Philip had 10 points and nobody else had more than 6 as we were humbled by a very bad Central Arkansas team. Nickolas Toy also sprained his ankle and is day-to-day for a week. Final Score: Incarnate Word - 59, Abilene Christian - 56. Man this was brutal. I'm trying to remind myself that this is a throwaway season but taking tough losses to bad teams still hurts. Foul trouble has been what has killed us these past few games as Incarnate Word shot 35 free throws in this one. James Reuter tried to win this one for us with 21 points and Michael Martinez had 10 points and 7 rebounds. PF Michael Mitchell has committed to play for Abilene Christian next season! Mitchell is a Junior College player from Andrews, TX who will not factor into the offensive gameplan but will be a huge presence on the defensive side of the ball. Final Score: Abilene Christian - 41, Texas A&M Corpus Christi - 72. We couldn't stop a high powered Corpus Christi team as the only player with a solid statline was Henry Kozak with 10 points and 6 rebounds. The bench came up with 15 points in this one and we have had a rough end to the season. Final Score: Lamar - 67, Abilene Christian - 50. This one was never really any close as we played a team much better than us. Nickolas Toy had 17 points and James Reuter added 10 of his own. This was a really awful end to the season for us as we gained momentum and then ended it with 3 blowout losses and an embarrassing loss to a team that only won one other game all season long. We finished 8th in the conference which is way better than what I expected at the beginning of the season but ended up being a bit of a disappointment after our strong start to conference play. Also finishing 8th is important as in the Southland conference only 8 teams make the conference tournament. Final Score: Abilene Christian - 32, Texas A&M Corpus Christi - 59. Our slide continues as we end the season on a 5 game losing streak. I still am very pleased that we finished the season with 12 wins and avoided last place in the conference which was the goal of the Athletic Department this season. As we can see Sam Houston State won the conference tournament which means their 29-3 season landed them the 14 seed against North Carolina. The end of the regular season has wrapped up and we have the postseason upon us. The player of the year in the Southland Conference is Junior SG Michael Hamner from Stephen F. Austin who averaged 10.7 PPG. The Freshman of the year was PG Thomas Wise from Sam Houston State who averaged 7.9 PPG. Finally the Coach of the Year was Jason Hooten from Sam Houston State! 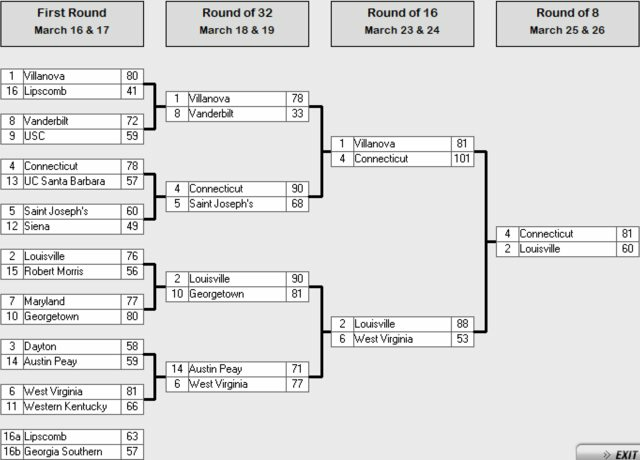 Here are the screenshots from the inaugural NCAA tournament. Good luck to all of the participants and may the best team win! 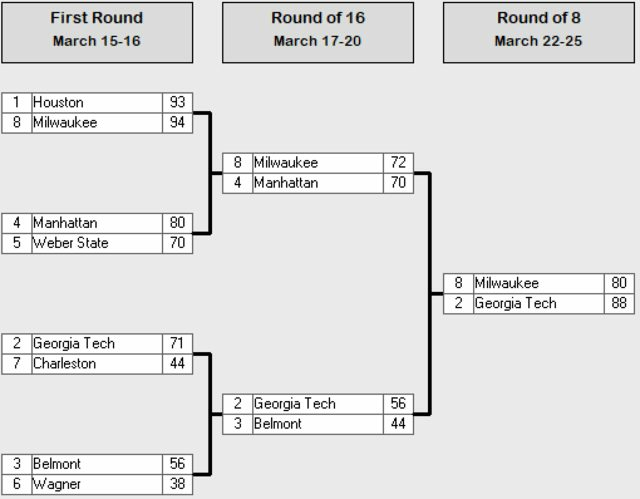 This region didn't get too crazy as the biggest upset in the first round was 11 seed Tulsa beating 6 seed Marquette. 4 seed Miami of Ohio was able to add on to their unbeaten season with a win over 13 seed New Mexico State but fell to 5 seed UNLV in the second round. 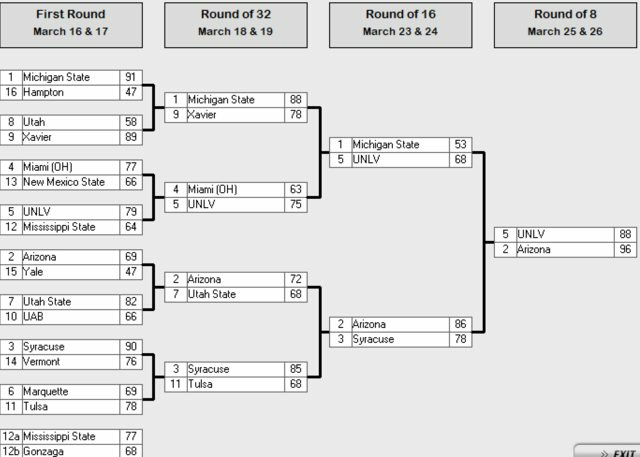 UNLV then followed that with a victory over 1 seed Michigan State to get to the elite eight where they lost to 2 seed Arizona. Congratulations to the 2 seed Arizona Wildcats on making the Final Four! 1 seed Butler had some trouble with 16 seed Montana in the first round but was able to come away with a 7 point victory. 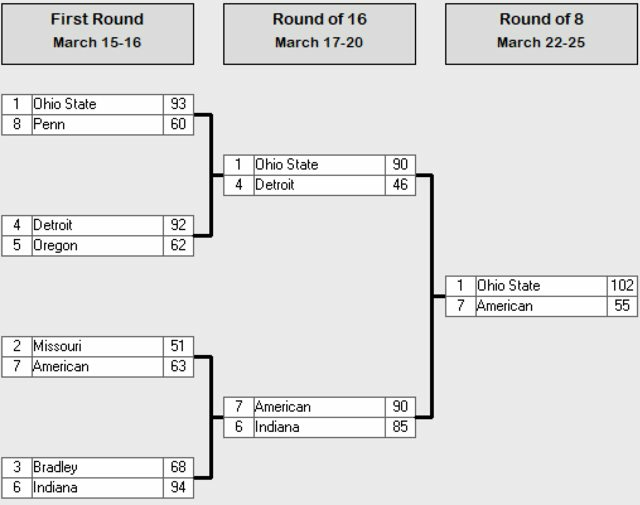 After that it was no surprise that 8 seed Illinois knocked them out in the second round. Our representative Sam Houston State was knocked out by 4 seed North Carolina in the first round by a score of 102-49 which was definitely not a good look for the conference. 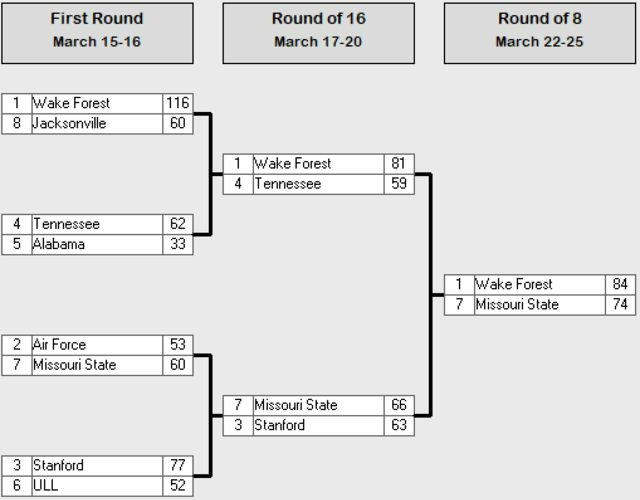 There was not a single upset in the first round of this region and even the sweet 16 featured the 2, 3, 4, and 8 seeds. 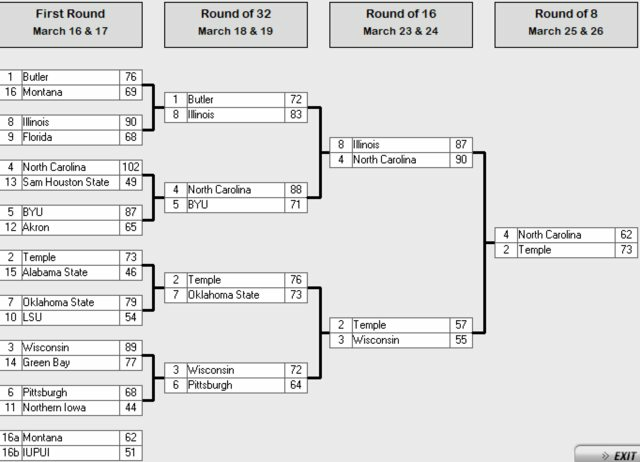 In the elite eight 2 seed Temple took down 4 seed North Carolina to advance to the Final Four! Next up we have the South Region! This one had some first round upsets as 9 seed George Mason took down 8 seed Old Dominion, 12 seed Texas beat 5 seed Memphis, 10 seed Kent State beat 7 seed Illinois State, and 11 seed NC State beat 6 seed Creighton. 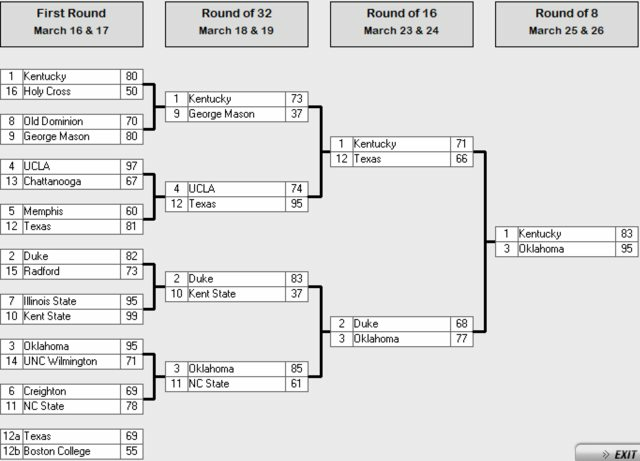 The 2nd round had some crazy results as well, as 1 seed Kentucky beat George Mason 73-37 and 2 seed Duke beat Kent State 83-37. Texas pulled off the upset of 4 seed UCLA to make it to the sweet sixteen where they eventually fell to Kentucky. 3 seed Oklahoma then toppled Kentucky to advance to the Final Four! Last we have the East Region! 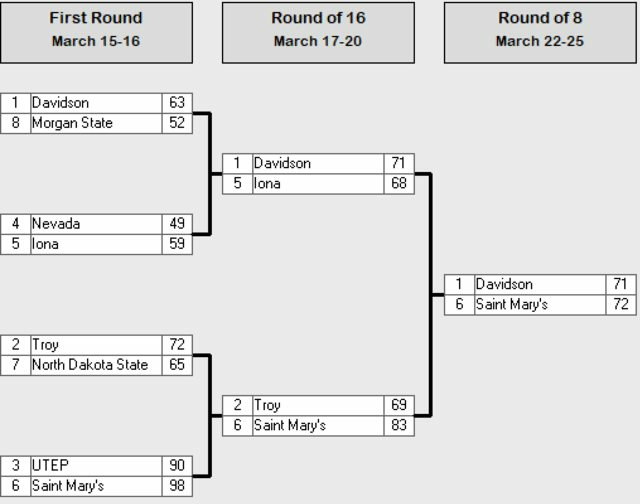 This region had our biggest upset to date which was 14 seed Austin Peay beating 3 seed Dayton 59-58! Unfortunately Austin Peay was unable to continue that success as they lost to 6 seed West Virginia by 6 in the next round. 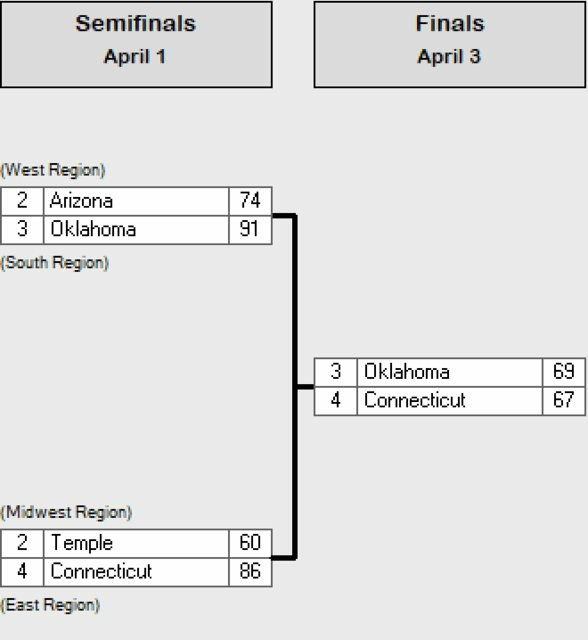 The rest of this region was pretty standard and in the end 4 seed Connecticut beat 2 seed Louisville to punch its ticket to the Final Four. Now for the Final Four! 3 seed Oklahoma beat 2 seed Arizona in the first game while 4 seed Connecticut beat 2 seed Temple in the second. Oklahoma won a thriller of a championship game by the score of 69-67 and I would like to congratulate the Oklahoma Sooners on winning the inaugural NCAA championship! Congratulations to Wake Forest for beating Ohio State and winning the Inaugural NIT tournament! 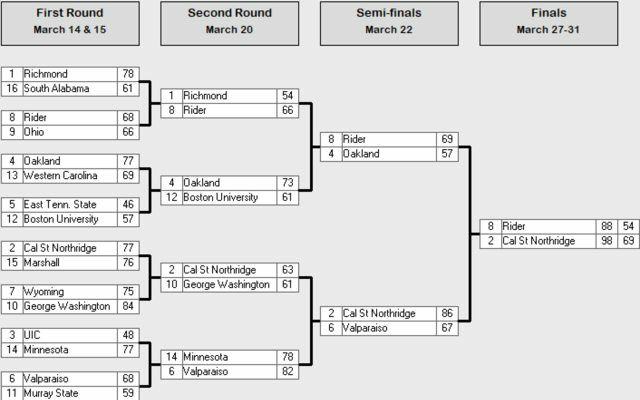 Congratulations to Cal State Northridge for topping Rider to win the inaugural CIT! Congratulations to Drexel for beating Charlotte and winning the Inaugural CIT! The Southland Conference had three teams that made it. 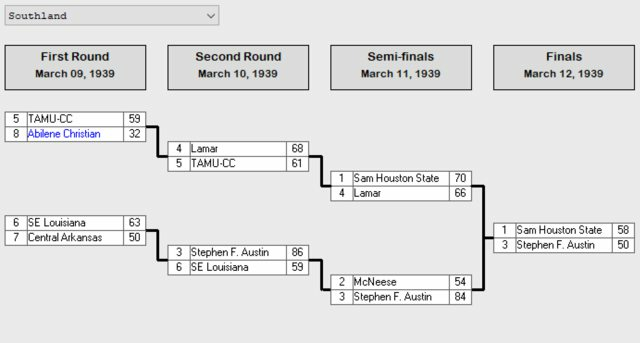 Stephen F. Austin made the tournament as the 1 seed but lost to Lehigh in the first round and Lamar made it as a 8 seed and lost by one to South Carolina State. Our 3rd representative was 10 seed Texas A&M Corpus Christi who lost in the first round to Toledo. Last edited by plydogg : 02-10-2019 at 09:02 PM. We have 3 seniors who will be leaving us after our inaugural season. They are all big men and we will be having a difficult time replacing them next season. Our first man up is C Michael Martinez from Oberlin, Kansas. Martinez was our starting C all season and averaged 6.4 points, 4.8 rebounds, and 1.1 assists per game. He was named player of the game 3 times and had career highs of 15 points, 11 rebounds, and 4 assists. Next up we have Michael Rodriguez from Houston, Texas who unfortunately lost a third of the season to a brutal foot injury and was greatly missed. He averaged 6.6 points, 8.3 rebounds, and 1.1 assists per game with career highs of 14 points, 14 rebounds, and 5 assists. Him and Michael Martinez made up our two starting big men this year and losing both of them will be tough. Our final senior is PF Henry Kozak from Huntsville, Texas. Kozak started 9 games in place of Rodriguez when he went down injured and played in a total of 28 games this season. He averaged 2.2 points and 2.1 rebounds in 13.6 minutes per game. His career highs were 10 points and 9 rebounds.